SMB Networks LLC was interviewed and Named One of Connecticut’s Top 10 Healthcare IT Service Providers of 2018. Hamden, CT, February 21, 2019 --(PR.com)-- SMB Networks LLC is pleased to announce that the company has been named as one of Connecticut’s top 10 Healthcare IT service providers of 2018 by Healthcare Tech Outlook Magazine. They have been featured in the December 2018 edition of HT. 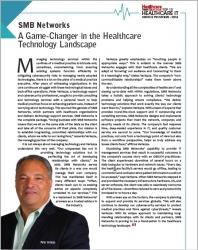 The full article can be read in December’s Digital Issue of Health Tech Outlook Magazine. Peter Verlezza is the Founder of SMB Networks LLC, a fast-growing IT services firm based in Hamden, CT and author of 3 books, "Hassle Free IT MD" and the 2 Amazon best-selling books, "The Tech Multiplier" and "The Business Owners Essential Guide To IT and All Things Digital." For over 31 years, Peter Verlezza has been the architect of technology solutions that make sense for medical practices, small-medium size businesses and non-profits. His unique way of approaching challenges comes from a belief that it all starts with people. He currently serves on the board of the Connecticut Medical Group Managers Association.